(Pasteboard = cardboard, used to make bonnet brims). Straights. Dales Countryside Museum. CREDIT: Belinda May. CLICK on any of these to enlarge. The casual – and all too frequent – “coffin” and “shrowd” at the end of the Retreat asylum patients’ accounts, gets me every time. The patients’ private accounts for their personal, needful things, are a brilliant resource for the clothing/textile historian. From them, we can see that ‘Patent’ (shiny steel?) needles cost 3d in 1799. This was probably a set of 4 or 5. What were nineteenth century needles like? Blunt? Pointy? Both? Neither? Or even – as has been mooted – “flat-ended”..? The answer is – knitters, as ever, had their personal preferences. 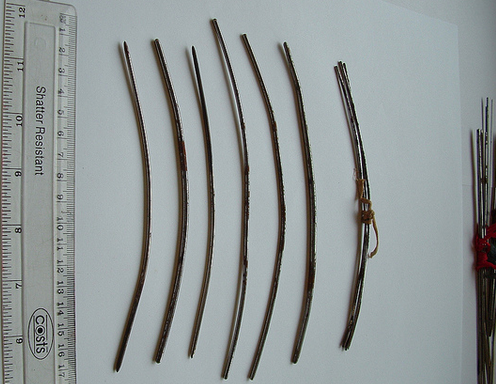 Surviving needles in museums across the North of England, show every variation; blunt and pointy, curved and straight. Although rarely, of course, flat ended. 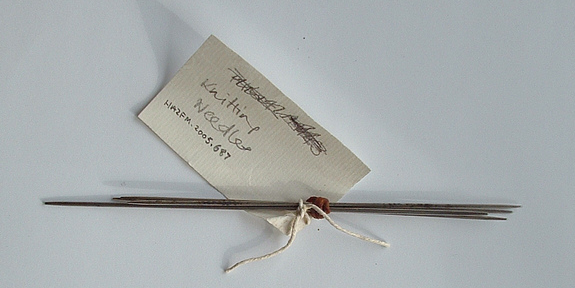 Knitting sticks were used by knitters of all social classes and backgrounds – witnessed by the sticks in the collection at the Bronte Parsonage Museum in Haworth. 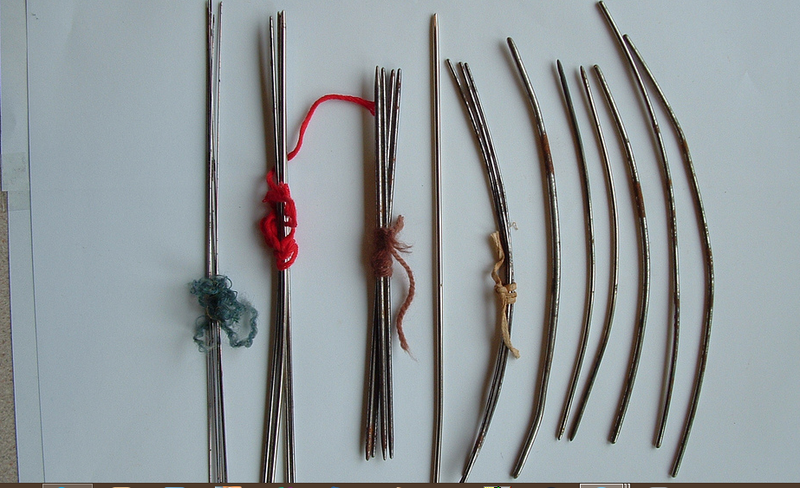 A couple of years ago, we documented some of the sticks in their reserve collection, and saw two knitting needles from a “work-basket belonging to one of the Bronte sisters”. [Ref #: HAOBP: H176:2 and 3]. The needles I examined had fine gauges, around 1mm, and one had a slight curve which would suggest it was used with a knitting stick. Anyone who believes all needles used commercially – or by genteel ladies – were ‘blunt’ or, ‘flat ended’, only has to actually see the extant needles, to realise the error of their ways. 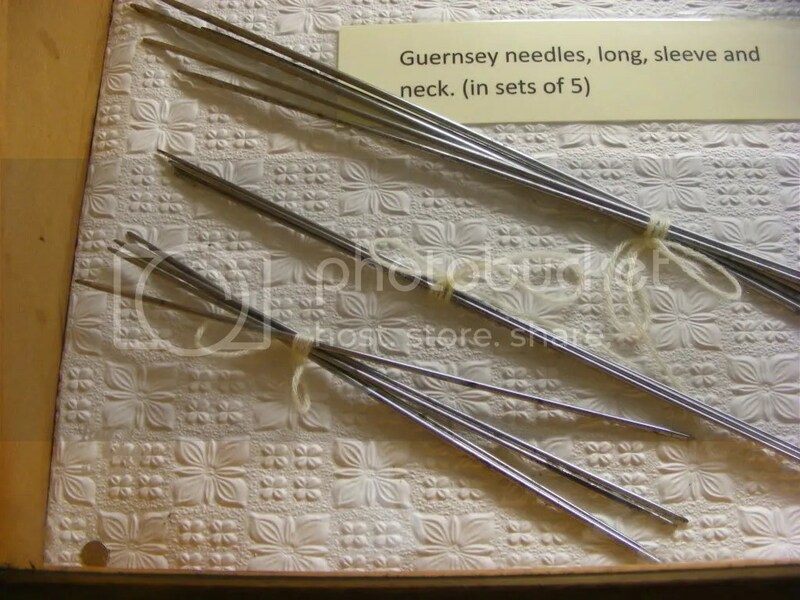 I leave you, Gentle reader, with these images of nineteenth century needles, to refute the bizarre theory that is playing out elsewhere on the internet. Gran Taught Her To Knit at the Age of Three, Maurice Colbeck, The Dalesman, Vol. 57, January 1996. The Old Hand Knitters of The Dales, Marie Hartley and Joan Ingilby. Your informative intelligent blog allows a fascinating glimpse into the past. When I worked as an interpretive ranger in the Blue Ridge Mountains of North Carolina, one of our Park neighbors gave us a set of needles made from rhododendron twigs that she had been told dated from the late 1800s, the period in which the cabin I was working in was built. They would have been around modern size 10s, very blunt, but what touched us was how smooth they were, with a warm glow and a gentle curve – all indications that they had been very well used. Our guess was the woman or women who had used the needles probably knitted with wool from their own sheep, as raising sheep to provide wool to sell to the local mills had been a local source of income well into the 1930s and people usually kept a fleece or two for their own use. Knitters, like weavers and spinners, used whatever they could lay their hands on, and were (and still are) incredibly clever about it. 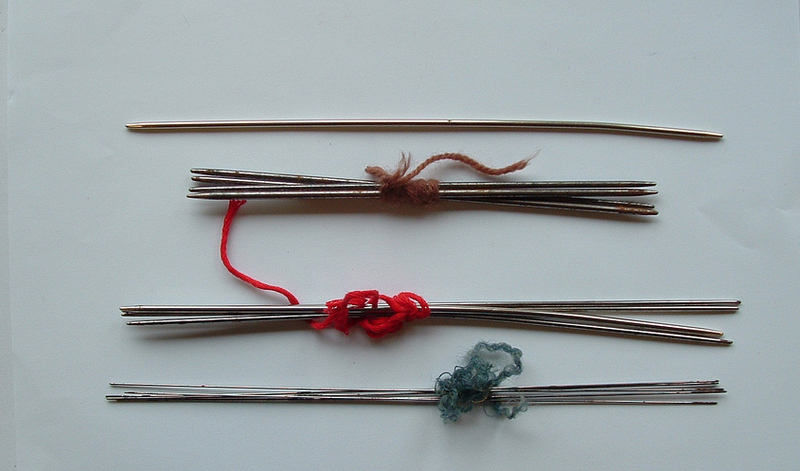 Knitting on hat pins! wouldn’t have occurred to me, though I have knitted on cocktail sticks for dolls when 14s were too big. To be honest, I haven’t come across any peculiar notions regarding flat-ended pins, but if there is one, thank you for burying it.